This year’s election is a watershed in Indian history. This editorial discusses possible reasons for the stunning defeat of the previous government. 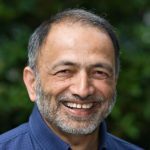 While there is no denying that the previous government could be faulted for many things including creating a leadership vacuum and letting corruption go unchecked, the knockout blow came from its inability to reform the institutions that are responsible for fulfilling legitimate aspirations of the masses. What should the central government do? The recent parliamentary election may turn out to be a watershed moment in Indian history. The previous government has lost by a margin that exceeded even the most optimistic expectations of its critics. Congress, for so long at the helm of affairs, has been decimated to the extent that its revival is in serious doubt. Of course, the sense of disenchantment has been palpable for a while, and one could easily point at many possible sources of it: slowdown in growth rates over the past three years, a non-communicative Prime Minister indicating a leadership vacuum, and to top it all – corruption scandals. This general sense of malaise and disenchantment created an open terrain for pundits to trot out their own pet theories. 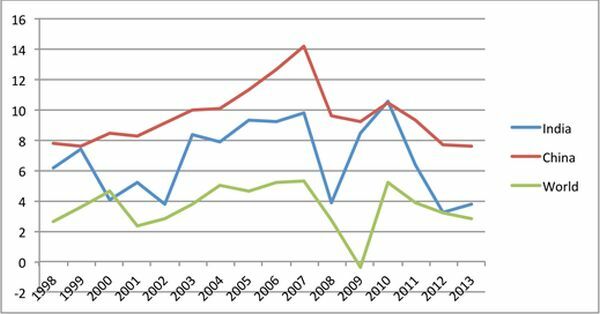 For example, that the Congress-led United Progressive Alliance (UPA) government killed growth by creating disincentives for investment – both domestic and multinational. Or, through a programme of redistribution, they snuffed out individual initiative and also created unsustainable fiscal deficits. In addition to all this, the government could not hold inflation, especially food price inflation, at bay. But is this what an average voter cares about? All those who turned against the previous government were not the readers of Business pages who worried about the investment climate or the deficits. They felt let down. Why? Which of the above mentioned conjectures are supported by evidence? 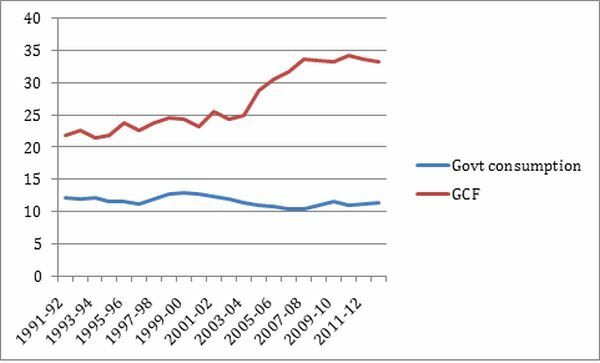 First, note that investment as a percentage of the Gross Domestic Product (GDP) – Gross Capital Formation (GCF) – rose significantly during the UPA regime. 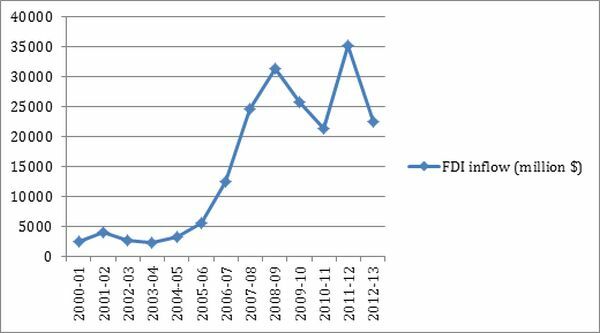 And, so did Foreign Direct Investment (FDI) except for the crisis years of 2007-2008 and the slowdown years of 2011-2013. Were the voters spooked by the specter of macroeconomic profligacy? It does not seem so if we take a look at what happened to fiscal deficit and public debt. 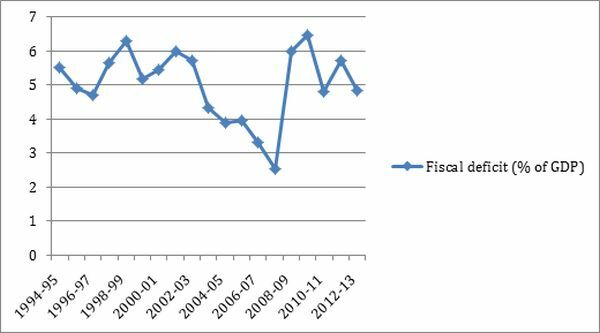 Except for the years of financial crisis (2007-2008) when the government had to borrow for the purpose of giving a much-needed stimulus, the fiscal deficit has not been out of control. Source: Ghatak, Ghosh and Kotwal (2014); based on World Bank data. 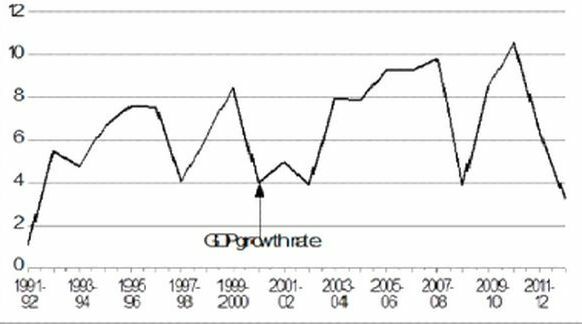 Most importantly, as Figures 4 and 5 below indicate, for 7 out of 10 years, the average growth rate of GDP has been higher than ever before (for a comparable span of time) and it compares favourably with that of the rest of the world during the same period. 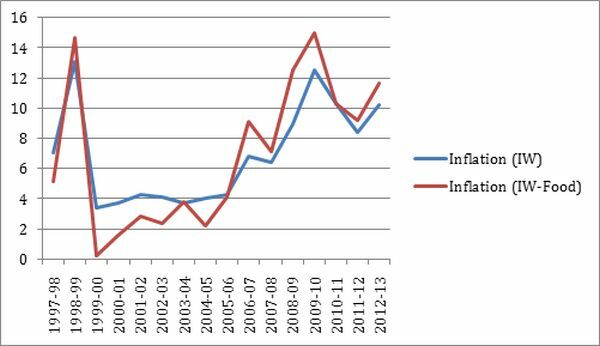 When the financial crisis hit the US and Europe in 2007-08, the growth in India slowed down but made a quick recovery. During the last three years, the growth in the whole world slowed down but admittedly Indian growth slid down more precipitously. Thus, the claims that the electoral disaster for the previous government was brought about by a weak growth performance induced by low rates of investment and fiscal profligacy are thus not supported by the evidence on the actual outcomes of the economy. The exception is the last three years during which the growth rate fell as it did in the world as a whole. And the growth slowdown surely played a role especially because the media targeted it as a clear manifestation of the failure of the government’s economic policy. In any case, a slowdown of the growth rate can only affect the electoral behaviour of an average voter provided he or she is directly affected by it. Given that a vast majority of Indian voters are under twice the poverty line, their preferences would depend to a significant level by what happened to the head count ratio. 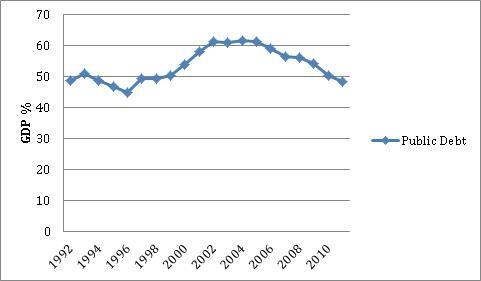 However, poverty was declining somewhat faster during the UPA regimes than what they had experienced in the past (See Figure 6 below). In fact, during the years of precipitous growth decline (2010-2012), poverty decline was the fastest due to the enormous rise in demand for unskilled workers in the construction sector despite the growth slowdown. Note that ‘Z’ and ‘2Z’ indicate the poverty line and twice the poverty line and their intersection with the cumulative distribution lines corresponding to the successive NSS years give the percentage of the population under the two poverty lines respectively. However, I believe that the growth slowdown rankled the urban elite much more than the masses that voted against the previous government. Most voters react to their own perceptions of how the government policies are affecting their lives and not to the numbers that appear in the business pages of newspapers. As mentioned before, the growth slowdown during the last three years did not slowdown the decline in the poverty numbers and a majority of voters are poor. What then explains the electoral rout? Inflation certainly has a valid claim. Yet, note that real incomes were growing during this period and poverty numbers based on (real consumption expenditure) were coming down. Note that growth is invariably accompanied by a decline in the percentage of population under the poverty line. However, this does not necessarily translate into a developmental transformation whereby the next generation gets catapulted onto a more productive activity, and therefore into a more secure and better life than their parents’. That can only happen if the public institutions that enable such transformation function effectively. During a period of sustained growth, as over the last twenty years in India, people become hopeful. Families that for generations had remained in low-productivity activities start dreaming of brighter futures for their children. This is especially so when people belonging to the same class are getting breaks and climbing out of poverty, “Why can’t my kids get a salaried job in the city when his could?” But if the growth in opportunities is not keeping pace with a visible rise in the consumption levels all around you, such dreams are shattered and resentment grows. The anger born out of frustration gets directed towards the government in power and the anger is intensified when corruption scandals break out one after another. I believe that this is one of the main reasons for the electoral rout of the last government. The generation that had experienced stagnant incomes had begun to hope that at last the country was on the move and their children would get education and secure salaried jobs. They could witness some people reaping such opportunities. But the hopes of many were frustrated, as the public system of education remained dysfunctional. Public healthcare fared even worse. Their hard earned money had to be spent on private schools and tuitions and private healthcare. The window of opportunity was open for just a fraction of the aspirants. It was not as if the UPA government was totally unaware of the simmering resentment. There was a spate of well-intended legislation aimed at the poor. But partly due to bad design and partly due to poor implementation, the attempt to woo the poor flopped. In fact, it may have made matters worse by promising much but delivering little. Right to Education did little to improve the quality of public education. The Public Distribution System (PDS), through which the Food Security Act is supposed to be implemented, is leaky and corrupt, and so is the Mahatma Gandhi National Rural Employment Guarantee Act (MNREGA). Public Health Clinics are dysfunctional beyond belief. Panchayats have proved to be ineffectual in creating local infrastructure that could have enabled the poor to realise their aspirations. Thus, though the poverty declined in absolute terms, the institutions that could have enabled the poor to climb out of poverty permanently have been ineffective. When a part of the population was experiencing massive increases in their standard of living, a majority of Indians was left to contemplate the prospect of never being able to transform their lives and to climb out of poverty permanently. The main reason for this long-run poverty trap was government failure to improve the institutions that spur development. How exactly do institutions impinge on the process of development? Though India now has the status of an emerging economy, 90% of its labour force still toils in the informal sector that is characterised by low level of technology and skills, and therefore, low level of productivity. It is evident that the high rates of growth achieved by India have been mostly due to the formal sector growth that in turn was based on technology transfer from developed countries. The process of development proceeds along two channels: (1) by improving the productivity of the informal sector, and (2) by transferring labour from the informal to the formal sector of the economy. Neither of the two channels can work well without properly functioning institutions. Why so? Note that productivity is low in the informal sector because it does not have access to good infrastructure (example, good roads, power, credit and information) as well as to skills. Such access is very much based on institutions of local governance such as panchayats. Similarly, the movement of labour from the informal to the formal sector depends on the skill level of workers. Without a minimum skill level, they could not be employed with a high level of technology, and it is the educational system that transforms unskilled labour into skilled labour. That system is clearly failing in its mission, judging from the Annual Status of Education Report (ASER) that evaluates the quality of education across the country. 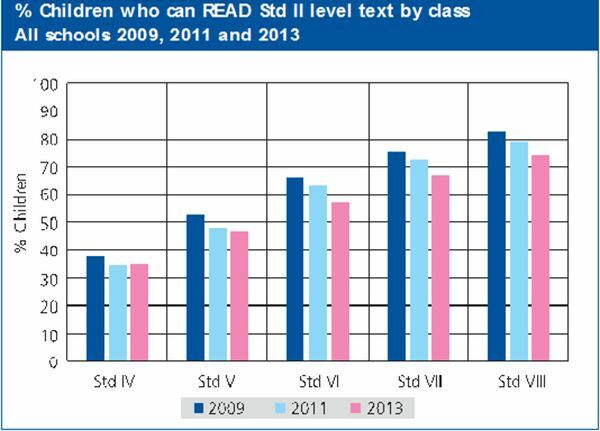 The ASER data (Figures 8a and 8b below) shows that the quality of education, measured by the simple metrics of (i) the percentage of children in higher classes who can read a standard II text, and (ii) the percentage of children who can do simple division in classes 4th through 8th, has deteriorated. 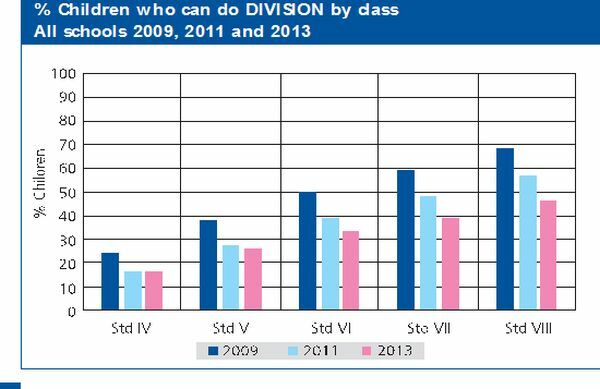 The demographic dividend that India is supposed to enjoy will amount to nothing given the state of Indian education. Improving the system of public education, however, is an uphill task. Education, first of all, is a state subject; the central government can pass laws but the implementation will always be in the hands of the states. This is why we see so much variation in the quality of education across states. It is the responsibility of panchayats to build schools and to hold teachers accountable. If the local governance at the Panchayat level is not satisfactory, the problem will remain unsolved. What is true of education is equally true of public healthcare, local infrastructure and other things that have the potential of enabling the poor to escape out of the poverty trap for good. What is needed is an improvement in the institutional performance at all levels and that is more easily said than done. What we mean by institutional performance is nothing other than the behaviour of the officials and workers associated with the particular institution. For example, schools and clinics will not function well if teachers and health workers do not show up very often or do not work diligently. It depends partly on the incentives built into the design of the institution (if such behaviour is monitored and used in the determination of their incomes), and partly on the social norms prevalent in the culture (whether there is a stigma attached to irresponsible behaviour). These social norms in turn are shaped by the history and geography of the place. Thus, a significant determinant of institutional performance lies outside any quick policy fix today. Social norms can change in response to a change in the incentive structure but it takes time. This is what makes improving institutional performance a big challenge. Often, even well-designed institutions perform badly. The 73rd amendment in 1992 was intended to devolve power down to local levels to make the allocation of government resources more aligned with local preferences, and the government more accountable to the people it serves. Officials at all three levels of the Panchayat are elected through a democratic process. One can hardly find fault with the design of this set of institutions. Even elections take place as ordained and the voter turnout is impressive. By design and in operation, these institutions – vital for development – should serve the interests of the majority. But in many states, they do not, and the reason is that despite the democratic design, the local elite can easily manipulate these institutions to their own advantage. Even centrally allocated funds do not get used for their intended purpose. The demand for MNREGA works gets suppressed. Public goods that would benefit the poor do not get built, if any of this would increase the wages of the local labour at the expense of the local elites (Anderson, Francois and Kotwal 2014). The local elites are in a position to do so because the local population is still dependent on them for warding off consumption contingencies when other channels such as access to formal credit are conspicuous by its absence. As long as people are living at subsistence with a contingency such as bad weather or a family illness lurking around the corner, this dependence will continue. If the incomes increase sufficiently so that people can depend on their own savings, the dependence will go down. Similarly, if the development process creates alternate sources of credit, the dependence will go down. The catch-22 here is that, partly, the process of development that would break the stranglehold of the elite is itself under their control. Improving the institutional performance, therefore, means unveiling reforms that would change the ethos of the whole country. This is no easy task. But does this mean that the central government can do nothing? Modi has fought and won the election with the slogan of ‘Good Governance’. It is a short form for ‘improvement in institutional performance’. I have argued above that it is a promise hard to fulfill and yet it is exactly what the electorate wants. What can the Modi government do? The ethical standards observed by local government officials could hardly be independent of those followed by the higher-level officials such as cabinet ministers and the upper echelons of the Indian Administrative Service (IAS). A code of conduct for the higher level officials is something the new government can enforce, and in all likelihood, they are likely to do so. One reason for local corruption is that the public at large knows little about the funds that the local governments have at their disposal and their intended use. The monopoly of information confers a great deal of power on those who have it. The central government can reduce this power by posting (and pushing the state governments to post) the relevant information online. If villagers are unable to access it, Non-Governmental Organisations (NGOs) could do it on their behalf. Right to Information Act enacted by the previous government is helpful in this regard. Since local elites are able to use the institutions for their own benefit by exploiting the dependence of the local population, it is crucial to reduce this dependence. Technology can be used judiciously for this purpose. For example, if the wages of workers participating in MNREGA projects are transferred directly into their Unique Identity (UID)-linked bank accounts, the local elite can be bypassed to a large extent. This is something that was already started by the previous government and will hopefully continue. To sum up, this year’s election is a watershed in Indian history. The stunning defeat of the previous government was most likely a result of the frustration of unprecedentedly high aspirations created by sustained growth in the previous three decades. There is no denying that the previous government could be faulted for many things including creating a leadership vacuum and letting corruption go unchecked under its watch. I believe however that the knockout blow came from its inability to reform the institutions at all levels that are responsible for preventing legitimate aspirations of the masses from being realised. Clearly, the mandate of the new government is to improve institutional performance. This is a highly difficult task as institutional performance depends on many factors beyond the control of the central government. However, there are a few things that the central government can do to fulfill the mandate given to them by the voters. If they fail, the surge of enthusiasm for them will turn into a tidal wave of resentment. Acknowledgments: This paper draws heavily on Ghatak, Ghosh and Kotwal (2014). The graphs are all reproduced from that paper. It also draws on the talk I gave in a symposium on Indian election, held at the University of British Columbia on May 20, 2014. I am also grateful to Parikshit Ghosh, Maitreesh Ghatak and Arka Roy Chaudhuri for helpful comments. 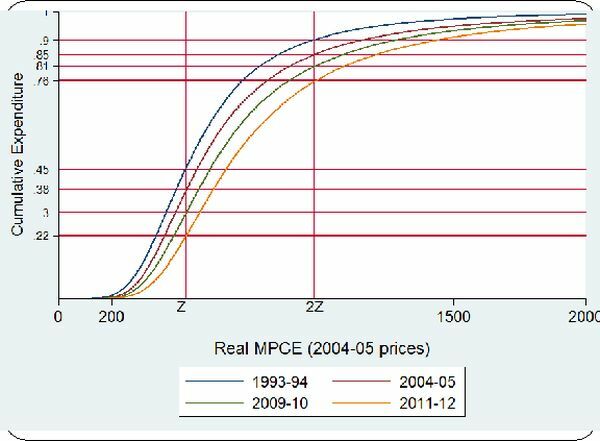 Ghatak, M, P Ghosh and A Kotwal (2014), “Growth in the Time of UPA: Myth and Reality”, Economic and Political Weekly,April 19, Vol. XLIX, No. 16, pp 34-42. Anderson, S, P Francois and A Kotwal (2014), ‘One Kind of Democracy’, Working Paper, University of British Columbia.